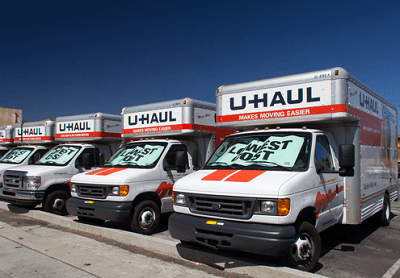 Home > Moving Guides > Truck Rentals > Renting a Truck > How Much Does It Cost to Rent a U-Haul? How Much Does It Cost to Rent a U-Haul? If you are moving to a small house or apartment, you probably want to move on your own. Have you considered renting a U-Haul truck? The popular truck rental company has vehicles designed for any type of move that you want to do yourself. They offer everything from pick-up trucks for small moves to 26' trucks for 3 to 4 bedroom homes. U-Haul advertises itself as the lowest cost guaranteed. You often see U-haul trucks with a familiar green $19.95 price tag on the side. But is that a clever advertising ploy to get you interested in using their product? How much does U-Haul actually cost? The price depends on the size of your truck and duration of the move. You will also pay taxes and environmental fees, so the price U-Haul advertises is never the final price. What about the U-Haul $19.95 flat rate? The flat rate of $19.95 usually always comes with additional fees. For example, a one-way truck rental will come out to $124.95 extra. Usually only the pick-up trucks and cargo vans come out to $19.95. Larger moving trucks cost $10 to $20 extra daily. There are also mileage fees which range from $0.59 to $0.99 per mile and a gas re-fill charge if the tank is empty on return. What are the U-Haul options? U-Haul truck share is one of the most flexible deals you can get. This allows you access to a moving truck without the costs or responsibilities of owning one. You can rent a truck for any amount of time based on your schedule. Pick up and return it at your convenience... any time, day or night, using your phone. One-way truck rentals can help with long distance relocations. There are over 20,000 U-Haul rental locations spread out across the U.S. and Canada. Find one near your destination and drop the truck off at the closest location without having to drive it back to where you started. In-town truck rentals are for local relocations where you pick up and drop off at the same location. If you only need a truck to move within the state, or up to 40 miles, truck rates start as low as $19.95. If you need extended miles or days, there's a special rental rate for that. What size vehicles does U-Haul offer? U-Haul has several trucks you can choose from, depending on the type of move and how much you are willing to spend. Bed dimensions: 7'10" x 5'2" x 1'9"
The other types of trucks you can rent at U-Haul are mostly for moving full bedrooms. For example, the 10 ft. and 15 ft. box trucks would be ideal for 1 to 2 bedroom moves, whereas the 20 and 26 ft. box trucks would be best suited for 3 to 4 bedroom moves. 9'11" x 6'4" x 6'2"
15' x 7'8" x 7'2"
16'9" x 7'8" x 7'2"
19'6" x 7'8" x 7'2"
26'5" x 7'8" x 8'3"
U-Haul has liability coverage that qualifies as insurance and not just valuation. U-Haul uses a licensed insurance company called Repwest. Since most personal policies don't cover rental trucks, it is recommended that you purchase one of the two types of liability coverage offered: SafeMove and SafeMove Plus. SafeMove frees you from any accidental damages that may happen to the truck during the move. This includes denting the side, cracking the windshield, or even breaking a side view mirror. If your truck is stolen, you need to provide evidence that there was no negligence on your part. It does not cover collisions with overhead obstacles. It also does not cover cut, blow, or damaged tires. Safemove also covers cargo, so your goods are safe from accidents, fire, or storm . Cargo coverage has a $100 deductible with a limit of $15,000 for an in-town rental and $25,000 for a one-way. This plan also offers $1,000 for medical bills in case of an accident. SafeMove Plus covers everything above with a couple of additional things. If you are in an accident with someone and injure them, the SafeMove Plus supplemental liability insurance protects against possible lawsuits. This insurance offers you $1,000,000 and no deductible. In addition, the Plus coverage takes care of overhead collision with obstacles which is the most common accident among U-Haul customers. It covers cut, damaged, or blown tires. U-Haul also offers less comprehensive coverage for small moves -- usually just a collision damage waiver. This coverage includes a low $150 deductible for most accidental damage and no increased premiums. What else does U-Haul provide? Do you need a credit card to reserve or rent equipment? Yes, making a reservation online requires a credit card, but you are not required to use a credit card when paying for your rental. American Express, Discover, MasterCard and Visa are accepted. Is my reservation guaranteed? U-Haul agrees to contact a reserved customer the day prior to pick up and finalize time, place, and equipment size. If upon contact, the reservation details vary from the customer's initial reservation preferences and are not agreed upon, U-Haul will terminate and charge a $50 "Reservation Guarantee" payment. If U-Haul fails to contact the customer and are unable to meet the requirements, they will pay you $50. How will I know where to drop off my equipment? Call the phone number listed on your rental contract to find out the most convenient location to return your equipment upon arriving at your destination. How do I get a copy of my receipt? Every customer gets a copy of their contract. This contract is your receipt. However, if you want another, you can look up your order or submit a contract request. Why aren't the rates for some equipment quoted to me online? Some of the equipment is available for local moves only -- such as the cargo van, pick-up truck, and open trailers. Trailers and towing equipment may not be compatible with the towing vehicle you chose. Roof pouches and horse trailers are only available in specific markets. Contact your local U-Haul for options. Rate this guide How Much Does It Cost to Rent a U-Haul? Should You Rent a Moving Truck? What Size Moving Truck Do You Need?